We’ve reached the Top 5. This journey is almost over. Of anyone in the Top 10, this prospect made the biggest leap from just a year ago, and he’s really, really good. This is to show what value a player might provide at the MLB level. The higher the risk, the less likely a player will reach that ceiling. Editor’s Note: I am not a scout (#notascout). I am an amateur when it comes to evaluating players. I don’t claim to be a pro, I just want to pass along the information I observe/obtain to the people. Notes and comments are based on personal observation, talking to sources, reading scouting reports and watching video. For future entries in this series: All ratings in the charts below are on the standard 20-80 scouting scale, where 50 is roughly average, 80 is elite and nearly unattainable and 20 is unacceptably poor. Enjoy. Other notes: “Role” is a realistic future role (slightly optimistic in some cases). Age is the 2019 season age for the player (June 30 is the cutoff date). 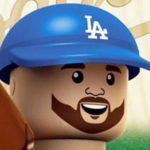 Summary: When the Dodgers made the little-known a 9th-round pick out of a small California college, no one would have thought he’d be where he is now. 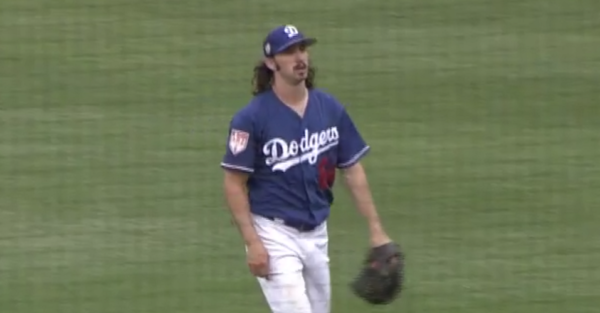 He won the organization’s Branch Rickey Minor League Pitcher of the Year award after a fantastic 2018 season that saw him anchor the Drillers’ rotation. He struck out nearly 30 percent of the hitters he faced and still, seemingly, hasn’t reached his ceiling. 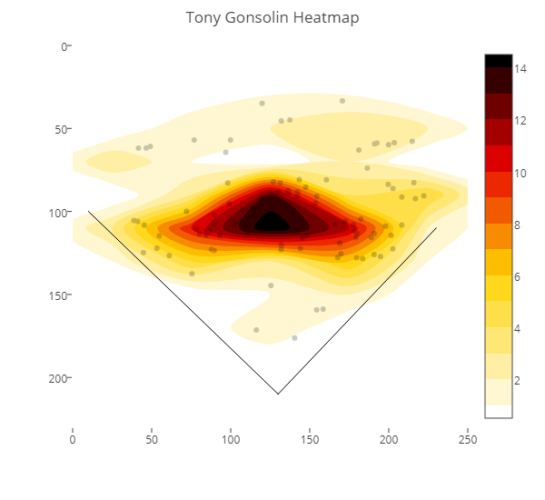 Gonsolin has a legitimate 4-pitch mix that has made it more likely he’s going to stick in the rotation rather than moving to the bullpen. His fastball sits in the mid-90s and has touched 100 MPH, but that was in relief a couple seasons ago. His velo held deeper into his outings to the point where it’s the norm. He’s able to locate it all around the strike zone. He has three offspeed pitches, with his curveball being the one that misses bats the most. It’s a high-70s/low-80s pitch with a lot of depth. His mid-80s slider is thje “worst” of the four pitches, but it’s a different look than any of his other offerings, so I suspect he’d use it sparingly. HIs high-80s splitter/changeup combination has serious diving action that gets some swings and misses and generates weak contact. He’s becoming more and more comfortable with the pitch and will throw it in any count. Gonsolin has a clean and easy delivery. He’s athletic (was a 2-way player in college), which helps him repeat his delivery. While he’s not a physically imposing presence on the mound, he has an extremely quick arm that helps him generate his increased velocity. He delivers his pitches from an almost over-the-top arm slot which causes some fluctuation in his command/control. It could cause him to end up in the bullpen, but for now, his future is in the rotation. If Gonsolin were 2-3 years younger, he’d be the top prospect in the system. His ceiling is pretty high considering he has premium stuff, maturity on the mound and feel for pitching. He could be a No. 2 starter if everything clicks. If not, he’s a solid mid-rotation pitcher. If he has to move to the bullpen, he could be a lights-out, high-leverage reliever. He’ll probably head to Triple-A Oklahoma City to begin the season. He could very easily see Los Angeles in some capacity in 2019. 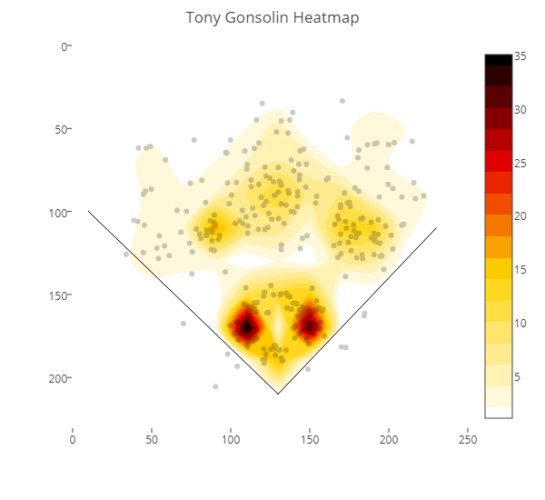 These heatmaps are to show where the pitcher’s batted balls tend to fall (first map) and where his hits allowed go (second map).